Located on the corner of Oven and Ballarat Streets in Brunswick, 8 Ballarat Street sits within a pocket of Brunswick South of Hope Street set to see significant change over the coming years as the surrounding low scale industrial uses are consolidated in line with the desired outcomes of the strategic planning policy. 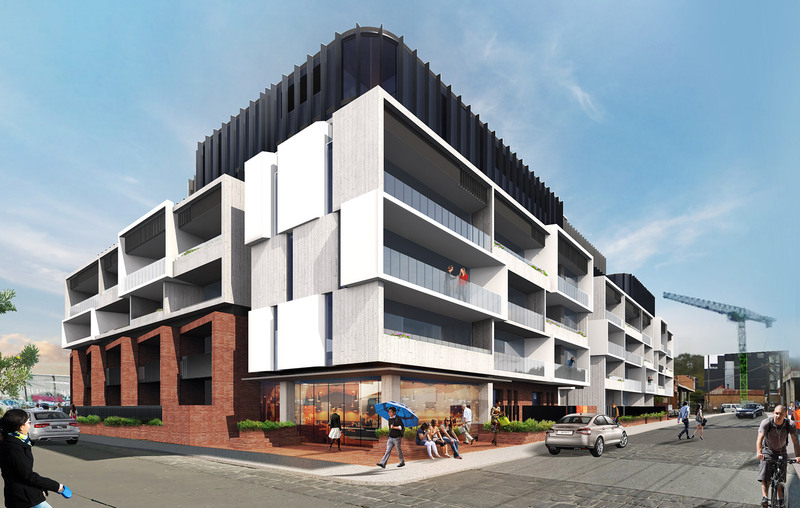 8 Ballarat Street is a collection of 141 Residential Apartments, offering a mix of 1, 2 and 3 bedrooms over 8 levels. The development is serviced by two basement levels accommodating 158 car parking spaces, 147 bicycle parking spaces, 8 motorbike parking spaces, and 147 storage lockers. Back of house services and bin/waste facilities are provided on Basement 01 with a central landscaped courtyard and a café on Ground level. Designed by Plus Architecture the development seeks a balance between the developing context of the suburb and its industrial past.